Got tech questions? Here I answer your tech questions previously asked. The end of last month (February), I put out a video asking for questions from YOU. Didn’t have to be tech related, but preferred them to be tech related. Thank you all so much for participating by asking your questions! Ended up printing 4 sheets of paper with your questions (and my answers) on them. Below is the follow-up video where I answer your tech questions and I answer them the best I could, without going into too much detail and making the video last as long as a movie. Enough chit-chat, now I answer your tech questions! Question: This is such a great idea. How did you think of this? Question: How long have you been working in IT? Question: Chris…can u add in training videos on Outlook 2012 etc? Question: Is there a website where we can learn more IT stuff? Question: What is the meaning of life in your opinion? Question #1: Do you like pancakes or waffles? Question #2: Serious question what do you think about certifications do they matter my comptia A+ and net+ just expired and i really dont want to get them again I have a 2 year degree in computer information technology and half a year of job experience do you think I should get them again do employers even care do you care about them. I am currently unemployed work contract just ended. to me personally their just a bs test that any monkey could pass with enough cramming they don’t really measure intelligence you just pay a ridiculous amount of money to get a pretty card and worst part they expire what’s deal with that comptia just wants money every 3 years. Question: Hi Chris I have set up Windows server 8, Windows 7 pro and PFSENSE in Oracle Virtual box but I can not join my client to the domain. This message pops up, ” An attempt to resolve the DNS name of a Domain controller in the domain being joined has failed. Please verify this client is configured to reach a DNS server that can resolve DNS names in the target domain. I appreciate your speedy help. Thank you. Question: I have a problem with Hyper-V Server 2012 Core – I installed GUI version also but no result. Same errors again and again. I googled everything checked everything but nothing worked. When computer are in domain, it gives me error about WINRM SERVICE WINRM QUICKCONFIG etc. in workgroup it gives error about authorization policy. I’m really suffering about this problem. I know you can help and please contact me. Question: Hi Chris! In the last video you said to use dhcp reservations for printers, not static IP. Can you explain why? Thanks! Greetings from Poland. Question: Chris, can you do a series of setup a Exchange server with mailboxes using Windows Server 2012 R2. I think would be great. Question: Could you do some linux videos about monitoring? Nagios, Zabbix or something else maybe? Other linux videos will of course also be highly appreciated. Question: Chris hi what a great idea this is. 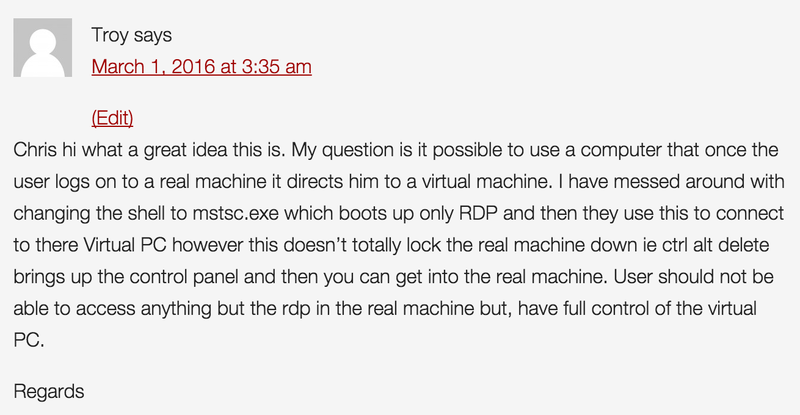 my question is it possible to use a computer that once the user logs on to a real machine it directs him to a virtual machine. I have messed around with changing the shell to mstsc.exe which boots up only RDP and then they use this to connect to there Virtual PC however this doesn’t totally lock the real machine down i.e. ctrl alt del brings up the control panel and then you can get into the real machine. User should not be able to access anything but the RDP in the real machine but, have full control of the virtual PC. Regards. Thanks for everyones input and participation! I totally enjoyed this one and think we might have to make this a more regular thing. Do you want me to continue doing these Q&A videos moving forward?